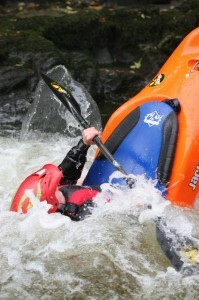 FlowFree Coaching | Kayak coaching & guiding in the UK and abroad. I have some hot news for you… I am able to release to you first, here on FlowFree, the dates for WCA Freestyle Development days over the next 6 months or so. Full details of locations and times etc will be announced for each one as they approach. Keep an eye on this website for details. Other dates may be added. Rhaeadr Mawddach- The big one! On Friday 24th of October I set out to go and scout Rhaeadr Mawddach… little did I know by the end of the day I’d be one of the few people to have ever paddled it and star on national radio! 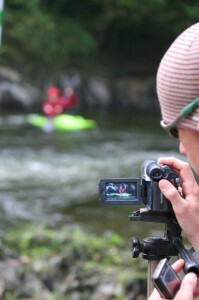 As I know most of you are just itching to see the footage, here it is… the story is below. I have been waiting to run these falls on the Upper Mawddach ever since I saw them about 2 years ago. Running the whole river I never had the time to really get the feel for the drop and have an objective look at them as there is always more fun bits to paddle downstream, but the falls never left my mind as something I wanted to run. After deciding today was the day to go and have proper look, I managed to persuade a friend and his wife to come along for “a nice walk”. Unfortunately for them, they were supposed to be going for a relaxing day at a spa (sorry for ruining that one guys!). On arriving, the falls looked amazing with good levels and the sun was beaming down – a true autumn day in Wales. For Rick and Claire Foster it was the first time they had seen the falls but they stayed cool and let me take my time deciding what to do. Very much appreciated! After strolling back to the car, I realised I had forgotten my river shoes and elbow pads not the best for a delicate mind-set but the time was right and everything felt good. Back at the falls I ran through my line once more in my head, passed Claire the camera and we were ready to huck. Getting into the flat pool above, it looked like one of the best horizons I have ever seen but with a stiff back and cold muscles I wasn’t going to rush things… a good 10 minutes of warm ups later, I was ready to go. Cameras rolling I set off down the entry rapid and I was through clean. Right, here we go… first drop I need to get a good flair off the right to avoid rolling or subbing out… No problem, right now the big one, I just need to hit the rooster tail… perfect. One impact on the slab, second impact through the big pillow, now correct the angle and wait for the pool! From leaving the lip of the big falls to the pool was shear exhilaration as the work was done and I could just let the boat fly. A few hours later the lovely Faern Cotton from Radio 1 called up to interview me, as they were looking for stories relating to ‘Waterfalls’ by the Stone Roses…. so it was obviously just the right day! The New WCA Freestyle Plan! The next WCA Freestyle Development weekend was due to be the 15th of November. With Stanley Embankment being shut due to works on the bridge (see previous post), I have made a new plan. 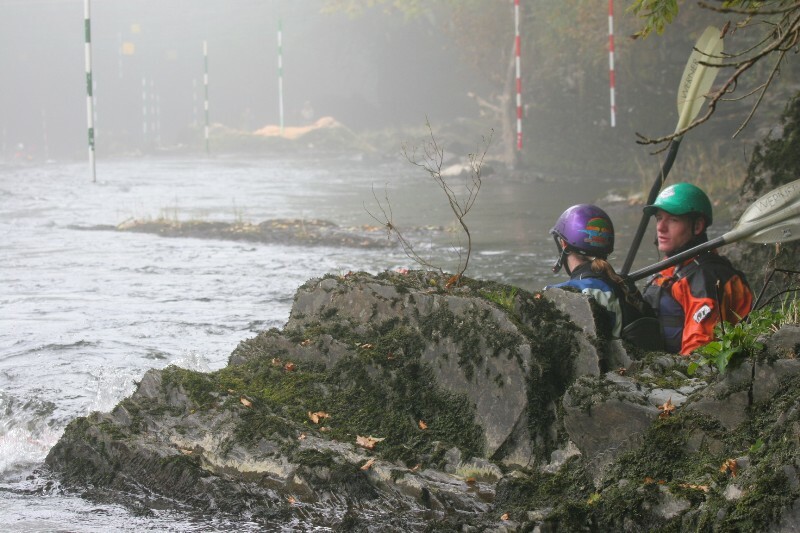 We’ll now be running a single day session at Chester Weir on the 8th November with a more advanced session at Tryweryn on December 6th. 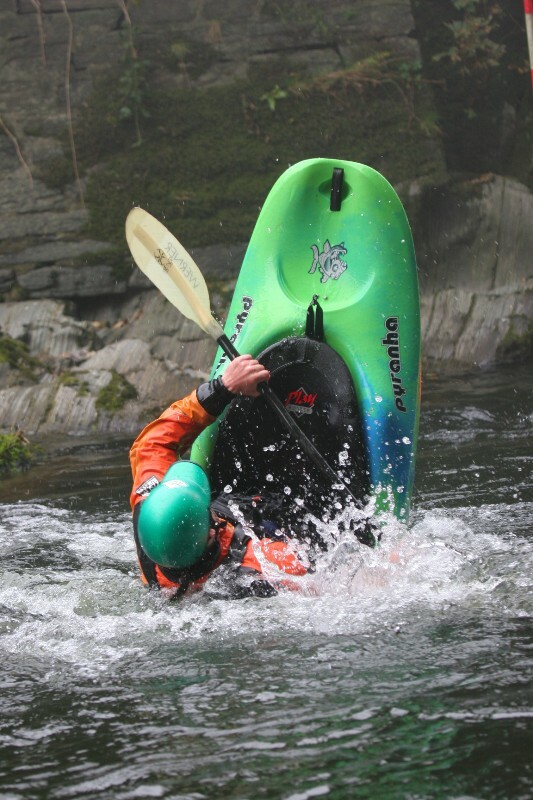 Chester Weir has a couple of friendly features and eddylines we can use to develop basic freestyle skills such as front surfs, spins, cartwheels and enders and is ideal for those who are less confident on white water. What we will cover will depend on numbers and abilities of those attending. Parking is available on Castle Drive (see map for details) – it is pay and display. Please note that there are no changing facilities. Meet at 9.30am the car park shown on the map. Booking: To ensure we have enough coaches, please email wca-freestyle@flowfree.co.uk if you intend to come to either day (you can still come if you haven’t emailed – it just helps us to plan if you let us know!). Please put either ‘Chester Weir’ or ‘Tryweryn’ in the title to help me keep track. Tryweryn has 3 good freestyle features to work on anything from spins and blunts to cartwheels, loops and felixes (no, really!). 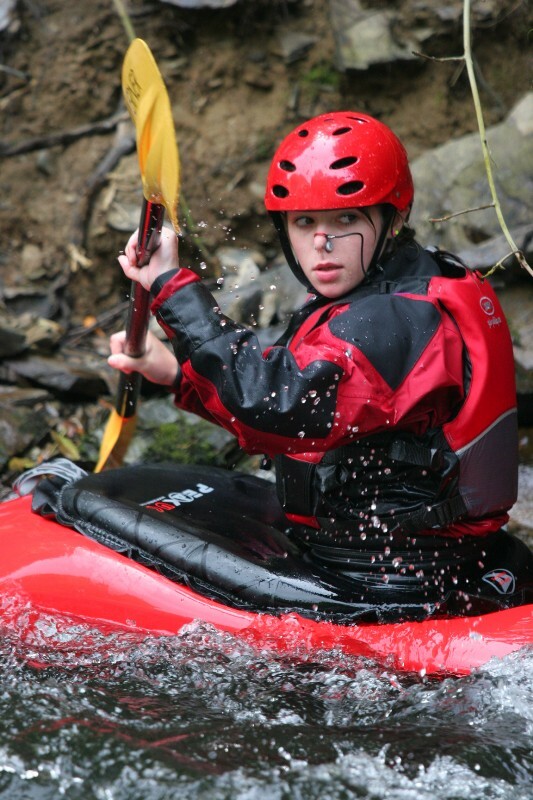 It is a bit more advanced so the day will be designed for people who are confident on whitewater and have a solid whitewater roll. Contractors for Railtrack are undertaking repairs to the bridge which forms the wave at Stanley. 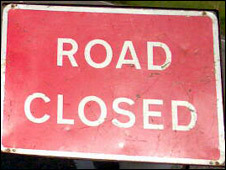 The tunnel is closed for 4-7weeks from 16th October. This means that the wave will likely be out of action until early December. WCA have been assured that the wave will not change as a result of these engineering works. This means the development weekend planned for 15-16th Nov will NOT be at Stanley! I am trying to make alternative arrangements at the moment but with current political issues and the less guaranteed water at Tryweryn over the next 6 weeks, finding a suitable venue for that date is pretty challenging. I hope to have further info by the start of next week. Please let others who were planning to attend know! On Friday Team FlowFree burned up the M6 for a very cold and (at times) very wet weekend in Scotland including the first ever Etive River Race. We arrived as the sun went down and got a cheeky run down the race section in super-low water. Everyone was expecting rain overnight but the sky was so clear, it was hard to imagine. We went to sleep in our shed-like wendy house safe in the knowledge we’d be racing a medium-low Etive in the morning. But no! The heavens opened and a gale force wind drove in through the mountains all night and all the following morning. 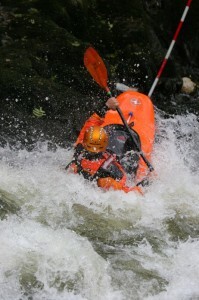 The Etive rose beyond recognition and the event organisers were forced to move the event to the tamer section of water upstream of Triple Step. Water levels changed all day reacting directly to how much it was raining and the wind was pretty much relentless. The race became no longer a challenge of skill combined with speed, stamina and judgement; but a flatwater battle against the elements. A Jackson Rocker was never going to be the craft that was first over the finish line! Dispite the set-backs Mother Nature threw at it, Etive River Race proved to be a well-organised and successful event pulled off with style. Had it have been possible to race on the section planned, I have no doubt it would have been a World Class event. 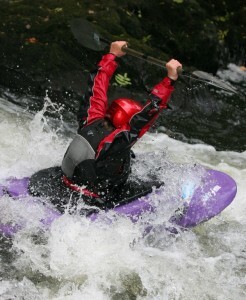 See www.etiveriverrace.co.uk for photos and results. As soon as the rain stopped, the rivers began to drop instantly. The Etive had dropped to something most people would recognise even as the minibuses took the last competitors out of the glen. Making the most of the water and the sunshine while it lasted, Team FF blasted down the Kinglass before heading to the prize-giving. FlowFree sponsored the event by donating a Steep Creeking course to the winners of the 16-18yrs category. The deserving team of Jonathan Hiam and Adam Cox were chuffed to pieces with their prize. The drive turned out to be the biggest adventure of all! It seemed Wales had recieved similar rainfall the night after Scotland, which wasn’t a problem until I tried to drive through mid-Wales with limited fuel at night (note: petrol stations between Denbigh and Aberystwyth are all closed after 10pm). 2 closed roads, 3 wheel-deep floods, 1 jerry-can of diesel and a million suicidal sheep later I finally arrived back in Aberystwyth! All our photos from the weekend are online here (click). A few weeks ago, FlowFree were due to be at the Alpkit Plastic Fantactic / Festival of Freestyle in Nottingham for our official launch and to provide freestyle and river running coaching sessions. We packed up and set off, all the time cursing the pouring rain. As we cruised over the Horseshoe Pass with our wipers on max, we got a phone call from Alpkit Jim “The course is rising fast; we’ll still have an event but if I was in Wales… I’d stay there!”. 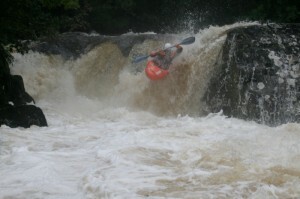 And so it was, the launch of a kayak coaching company was rained off! Over that weekend we ran 7 sections of quality whitewater (including sections of the Dee, Llugwy, Eden, Mawddach, Wnion, Conwy and Ogwen)… the rivers were stonking and we had a great time. Photos thanks to Richard Watson. 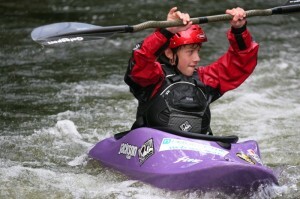 All of Tom’s photos are online at http://www.digibug.com/tlphotography/ – select the album “WCA Freestyle Development – Llandysul”. Full high resolution copies and prints are available to order. The video from the weekend is online here – Matt Cooke’s put it on facebook so you may have to ‘make him your friend’ before you can view it. I will try and get it on youTube or similar soon. 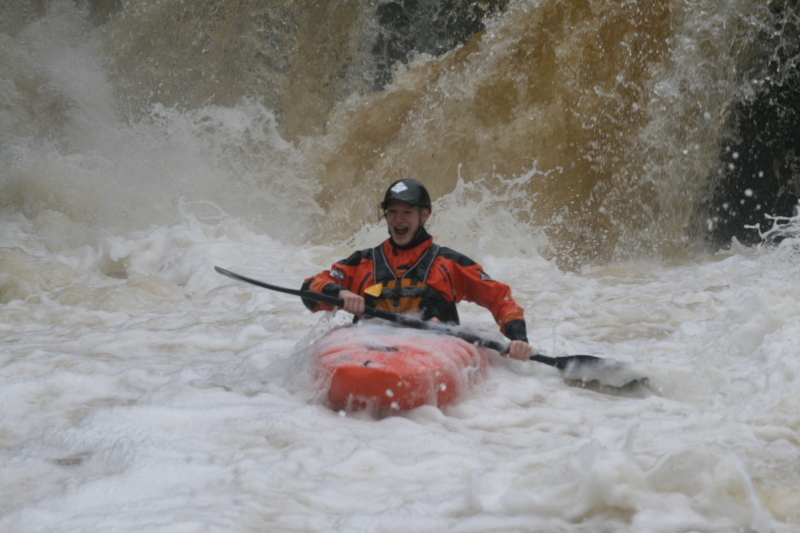 1st WCA Freestyle Developement Weekend – a success! The aim of the WCA’s Freestyle Development weekends are two-fold. Firstly, we want to provide opportunities for all paddlers to try out freestyle and get quality coaching without cost being a barrier. Secondly, we want to take those with talent into a Welsh Freestyle Squad for further development and to represent Wales at competitions across the UK (and abroad). The first of these weekends took place in Llandysul on September 27-28th. 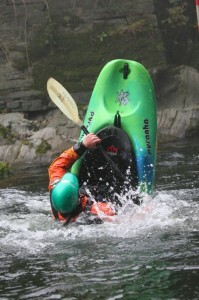 FlowFree coaches Lowri Davies (me) and Jon Davies worked with International Freestyle paddler Matt Cooke and white water specialist Tom Laws to provide a range a sessions to cater for all abilities; from those with only basic white water skills, to those able to cartwheel and loop. I also ran sessions for coaches to give guidance on how best to deliver freestyle coaching, easy ways of breaking down the moves and using land-based activities to aid understanding – on top of developing their personal freestyle skills. By Sunday afternoon, it was time for everyone to bust out their best moves for the first of our Welsh Freestyle Series competitions. This event was done in a “freestyle through the rapids” format, with points for everything including catching eddies, tailies, front surfs, cartwheels, bowstalls and even making the judges laugh. With eddyline moves and a 30-second flatwater section at the end, the course proved to be hit with all abilities – scores ranging from 100 up to 435 per ride! Congratulations to the winners, but well done to everyone who took part. There were some imaginative runs and if we can harness that enthusiasm then Wales will have a Welsh Squad to be proud of. Particular big-ups to Katie for the paddle over the boat trick and little James for his super slick technique – he’s definitely one to watch for the future! All Tom’s photos and Matt’s video footage will be online over the next few weeks and I’ll be sure put a link up on here. Next one: 15th-16th November, Stanley Embankment, Anglesey. Welsh residents with a fairly reliable roll welcomed. We are especially keen in getting juniors who already enjoy white water or freestyle and coaches wishing to get experience or tips on how to coach freestyle more effectively. Full details, including times, to follow – stay tuned. Any budding freestyle paddlers, or white water paddlers wanting to give freestyle a try, should come along to one of the WCA Development Weekends I’m organising. It’d be great to see as many youngsters there as possible! Drop me a line if you want any more info.